Following the Remembrance Service at St Mary’s, the WW1 Memorial Pennant (which has been made and designed by the High Halden Craft Club) will be escorted from the Church to the Memorial Hall by the Brownies. The Memorial Hall will be open at 12.30pm where there will be a welcome from the Parish Council Chairman. Various stands will be on display relating to WW1 and High Halden from the Horticultural Society, the Village School, Village Residents, Little Acorns Nursery and there will be other WW1 memorabilia from various contributors. The WI will be providing soup and scones on arrival, followed later in the afternoon by tea and cakes from the era. 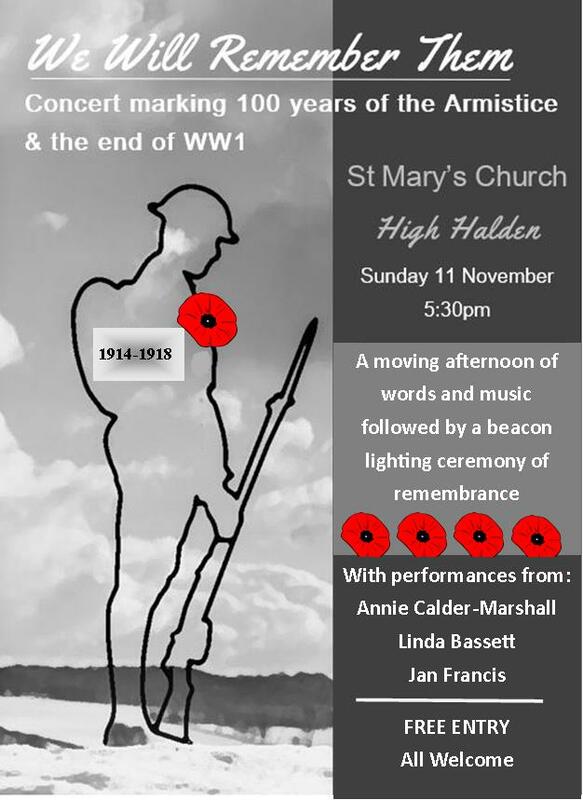 There will also be music by the Rhythm of Life Choir as well as a Pathe film from WW1. This will finish at 3.30pm. A charity collection will be made for the Army National Charity. At 5.30pm there will be a concert as depicted in the poster. 'The Chequers on the Green' has kindly agreed to provide shelter if the weather is inclement.